Sarah Graley’s Kim Reaper made a delightful debut last year, introducing readers to a college student who pays the bills by working as a part-time grim reaper. 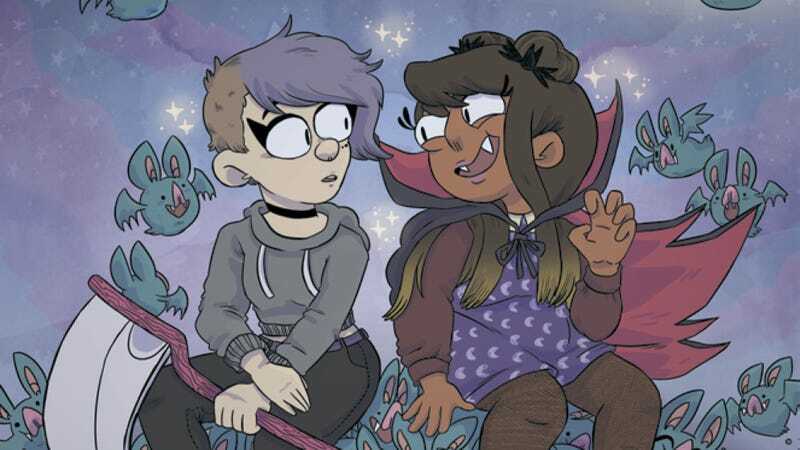 The series blends romantic comedy and supernatural horror into a joyful, enthusiastic exploration of courtship in wild circumstances, with a bright, exaggerated art style that makes it perfect for cartoon fans. Kim is back in the new Kim Reaper: Vampire Island miniseries, on the job and working the shittiest hours after breaking multiple grim reaper rules in the first book. Her schedule is cutting into her personal time with her girlfriend, Becca, so when Kim gets the opportunity to take Becca on an adventure, she grabs it. This exclusive preview of Kim Reaper: Vampire Island #1, on sale September 5, begins with Kim worrying that Becca might be freezing her out, but her girlfriend is really just enamored with Vampire Teen Drama, the latest trash TV sensation. Becca and her bestie, Tyler, are totally hooked, and when Kim lets it slip that vampires are real and she knows where they live, Becca and Tyler want to go there immediately. Graley’s already sharp cartooning has become even more confident in the past year, giving her characters heightened personalities that fill each panel with expression. One of those personalities is bigger than everyone else, and Graley turns Becca into a freight train of animated energy that sets her apart from her more demure companions. That energy is probably going to get her in trouble on Vampire Island, because she’s not the person to control herself when she gets over-excited.